It only took me a couple of days, after White Rock, to consider running in the 2011 Dallas Rock’n’Roll Half Marathon. I delayed my registration due to costs, and due to all the other complications that entered my life at the time. These complications also derailed my urge to update my blog; my focus was elsewhere. Shortly after running my first Half Marathon at White Rock, my beloved Golden Retriever Monroe’s health started to fluctuate, and it got to the point that I had to hand feed her. Her liver was starting to decline, and there was nothing that could be done, but to give her the most comfortable life possible, and hope that the Rx food was enough to keep her going. A month after White Rock my sweet Greyhound, Brewster, started having pain in his left shoulder. Thinking that maybe he hurt it in a fall in the laundry room, I watched it for a week or so, but when it do not get better I took him to his vet. Expecting to hear that he had some sort of tendon or ligament tear, I was extremely shocked at his diagnosis – Osteosarcoma (bone cancer); a viciously cruel form of cancer that is also known as exploding bone cancer. I was also handed the sobering news that for Brew, there would be no way to treat this disease, due to his age, and the location of the tumor. He was given 6 – 8 months. I still ran off and on to keep my sanity, but was not on any type of training schedule. When February rolled around, I got involved with a social running club that was doing these great Wednesday night runs, to prepare for the Dash Down Greenville St Patrick’s Day Run. It was there that I committed myself to doing the Rock’n’Roll Dallas Half Marathon. I already had upped my long runs back to 10 miles, so I knew it would not take long to get to the point that I could finish another HM. I had some interesting long training runs, which were run all through Downtown Dallas. I even came across a guy who bussed his way back into my home area from downtown, as I ran by. He yelled out to me, “HEY!! I can’t believe you ran all the way from the West End!” Yep I did. The week before the race, I was hit with a serious blow to my world; my sweet precious Monroe died. She stopped eating the week before, and the Monday before race day I had to make the most painful decision to end her suffering. She dropped weight rapidly, and two days before her passing, she contracted a weird raspy deep cough. She was slowly dying as we drove her to the vet. I never had a dog of my own, for this long. 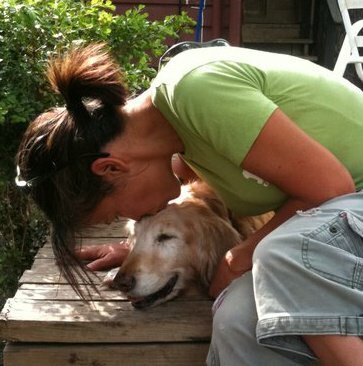 She was my first MY dog, and she made one hell of an impact for any other dog to try to follow. I could have very easily dropped out of the Half Marathon, and I would have had the right to do so. I still had Brewster to worry about; Monroe was his best friend, and his life partner. He was still sick and in time would meet the same fate as her. Yeah a lot on my plate. It was on the next day after sending Monroe to the Rainbow Bridge, that I received a sign. 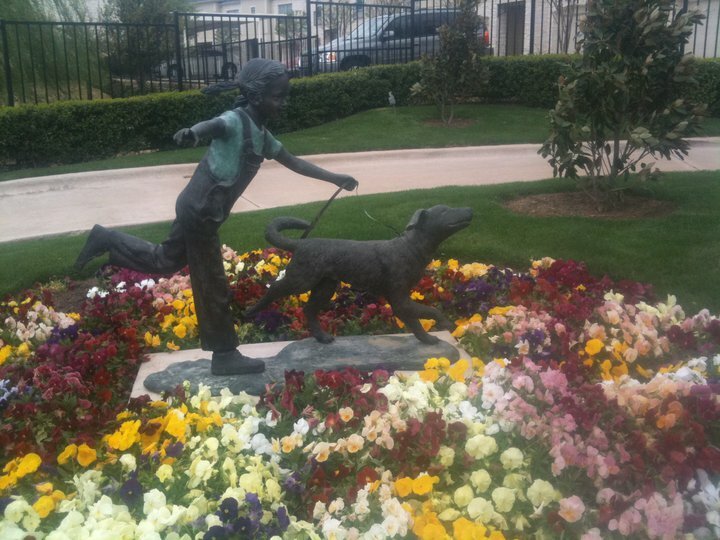 Never on any lunchtime run, had I EVER seen this statue. I passed its spot on almost every run, and until that day I never knew it existed. It was Monroe’s was of telling me to run the race. So at that moment I decided to carry on, and to run it in her honor. I even decided to carry her collar with me during the race. That day, at 2 hours 40 mins, I crossed the finish line, holding Monroe’s collar in my hand. A race finish that will always be near and dear to me. 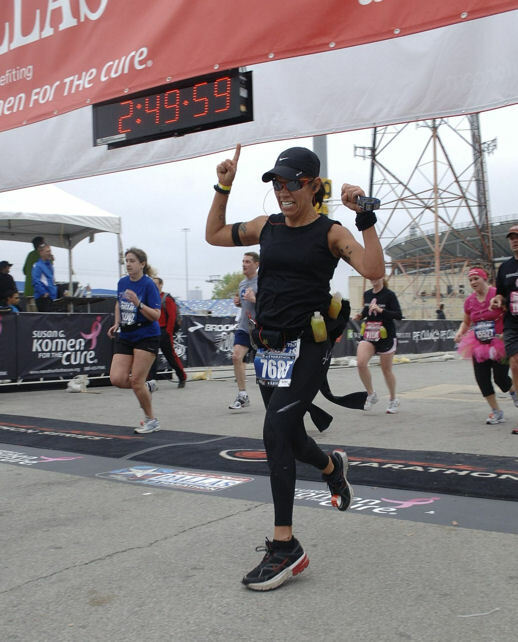 This entry was posted in Fur babies, Inspiration, Rock'n'Roll Dallas Half Marathon, running events and tagged dallas, grieving, Half Marathon, running, running through grief by Raven. Bookmark the permalink. I’m not gonna lie, I just cried a bit. Very touching that you ran with her collar. I’m still working on figuring out what I want to get for our Venus. She was, like your Monroe, my first dog. I still tear up thinking about her. As I ran I would reach down and touch that collar. My throat would lock up and constrict on me, and I would just about start to bawl my eyes out. If I had not needed to breath to run or see to run, I would have dropped to the ground and sobbed. Take your time on what to do for Venus; it will come to you.